Like everyone else on Castine Island, a small community in Maine, thirteen-year-old Abby Leigh is anticipating the comet that is supposed to turn the moon purple. The comet’s space dust does indeed create a violet moon and sky, but it also produces unforeseen, and devastating, consequences. Germs in the space dust attack the hormones of anyone who has gone through puberty, decimating Earth’s adult population. Abby and her brother Jordan must band together with the other remaining kids on the island and find a way to survive without the grown-ups. They can only hope that a cure becomes available before they enter adolescence themselves and fall victim to the pathogens, too. Night of the Purple Moon is a harrowing dystopian novel that is both inspiring and heartbreaking. It’s hard to imagine waking up the morning after watching a comet streak through the sky and finding out that all of the adults have died. This is exactly what happens to Abby Leigh and her siblings, twelve-year-old Jordan and two-year-old Toucan (real name: Lisette), though, and the ensuing story of survival kept me glued to the page. The pacing was spot-on, and I became engrossed in the Castine Island survivors’ efforts to stay alive as they waited for a cure. The way in which the kids form an organized society is very impressive without seeming implausible. In fact, the novel maintains its sense of realism throughout. Scenes involving the burial of the dead at sea are balanced with lighter scenes, like the surprise party that’s arranged for those sharing the same birthday month. There’s even an ice cream machine that the group’s resident genius, Kevin Patel, manages to get working; I couldn’t help but love geeky Kevin. This picture of a bunch of kids enjoying a day at the bowling alley eating ice cream and cake reminds you that they are still kids, even though the rest of the time they’re working a farm, taking care of the younger children, and disposing of the adult bodies. Everyone on this island has to grow up fast, but it happens at a rate that is convincing. I thought that the characters were well-developed, and Cramer did an excellent job making the dialogue sound authentic for twelve and thirteen-year-olds. Abby is a selfless, natural leader and a big reason why the Castine Island survivors work together and avoid the chaos on the mainland that is seen later in the book. Her brother Jordan possesses some fine leadership skills of his own, and when the Leigh siblings embark on a dangerous mission together, they must continue to tap into the courage and resolve that they’ve demonstrated all along. Just when you think these two can’t possibly give anymore than they already have, they somehow find the strength to press on. The last few chapters were absolutely riveting, and I couldn’t read them fast enough. 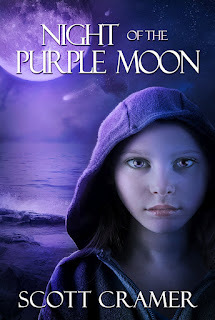 There are a lot of dystopians to choose from these days, but Night of the Purple Moon distinguishes itself with its unique premise and strong, determined characters. I think that middle grade readers would easily connect with Abby, Jordan, Kevin, and the others. Dystopian fans of any age will want to check this one out. The ending hints strongly at a sequel, which I’ll definitely read. How much I enjoy a dystopian novel depends a lot on how believable the world is. The world of Night of the Purple Moon is well thought-out, and I completely bought into it. This was a quick but absorbing read that is also a good introduction to the genre for anyone who hasn’t tried it before. The Kindle edition of Night of the Purple Moon is available for free download until September 12! Click here to get your copy now! Check out the blog tomorrow for my interview with author Scott Cramer! Great review Lee, Kevin was a favorite of mine ~ but I always love a good geek!! Thanks Ali! I love geeks, too, especially since I'm such a big one myself! Glad to see you enjoyed it. I am currently reading it now and enjoying it as well. Happy to hear it! It was an excellent read.